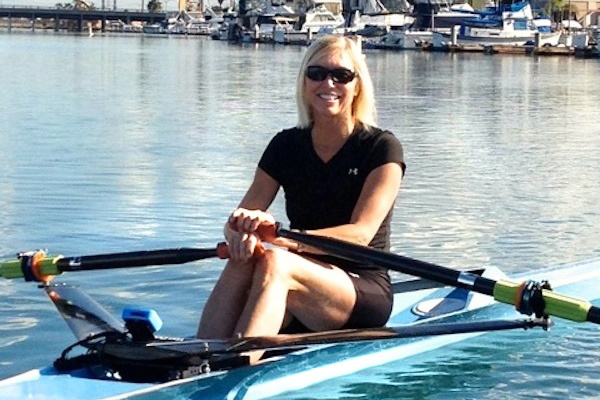 Joan Lind Van Blom, the champion rower and Olympic medalist who worked for 35 years in the Long Beach Unified School District as a physical education teacher and curriculum leader, inspired many tributes and a scholarship in her name after she died of cancer last August. Now, State Sen. Janet Nguyen, who represents a portion of Long Beach, has introduced legislation to name the bridge on State Highway Route 1, south of Loynes Drive and north of East 2nd Street as the Joan Lind Van Blom Memorial Bridge. “Whether it was on-the-water or in the classroom, Joan was a remarkable individual who served her nation and the city of Long Beach proudly,” Nguyen said. Van Blom was the first woman to win an Olympic medal for the United States in rowing. She also won a silver medal in the single sculls at the 1976 Olympic Games in Montreal and in the quadruple sculls at the 1984 Olympic Games in Los Angeles. She made the Olympic team in 1980, but the U.S. boycott of the games prevented her from winning a potential gold medal. For her numerous achievements, Van Blom was inducted into the Wilson High School Hall of Fame, Long Beach State 49er Hall of Fame Century Club and National Rowing Hall of Fame, and she was declared a Lifetime Member of the Long Beach Rowing Association. She was also named the recipient of the 2014 U.S. Rowing Ernestine Bayer Award recognizing outstanding contributions to women’s rowing. The legislation, SCR 102, is co-authored by State Senators Ricardo Lara and Isadore Hall and Assemblyman Patrick O’Donnell. Donations to the Joan Van Blom Memorial Scholarship can be made online. A CHAMPION FOR KIDS – Joan Lind Van Blom worked as a teacher and physical education curriculum leader for LBUSD.